This is the continuation of my book series blog post. This one however reveals my shameful admittance of how many book series I own that I have not completed! I'll get straight into the series and I'll meet you at the other side! Oooookay so that's 32 book series that I own (at least one or more of the books) and that I have not completed. I thought I was doing so well with how many I had completed until I started adding up the ones I hadn't. From doing this I am now determined to start bringing these numbers down and start finishing off a book series at a time in between my normal reading. I have already started by continuing the Lunar Chronicles and I am currently reading Cress (which I may have finished by the time this posts, fingers crossed) which will leave me Fairest, Winter and Stars Above to go in that series. I really hope you enjoyed these two posts as though it was a little shocking, I enjoyed putting them together. How many book series have you left unfinished? Is there anyone out there with a number higher than mine (please)? What's your favourite book series that you've read? I've been recently sorting through my books and bookshelves (see my un-hauling blog post here) and I noticed that I own a lot of book series. A lot more than I realised. As I was going through them I started sorting them into ones that I had finished reading and ones that I still needed to complete and I was shocked by what I found! This blog post is only covering the book series I have completed and I have a separate blog post coming with the book series that I have yet to finish. 3. I have read everything that I own from the series so far. I may not have the correct name of the series/trilogy/duology for everything mentioned, but I've tried my best to put it right if I can. So in total that's 17 book series that I am completely finished with/up to date with. I have to say it was more than I was expecting so I am quite pleased with that total. This smug feeling didn't last long, but you'll see why in my next blog post, so please keep your eye out for that very soon. How many book series have you completed? Have you read any of the ones I've completed? What id you think of them? I was lucky enough to receive an e-book copy of Nika directly from the author D. H. Gibbs in exchange for an honest review. 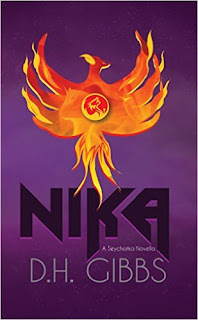 Nika is a taster novella following the main character Nika as she is kidnapped from the street outside her home and is kept captive by a set of people looking for their lost leader. Her main contact with them is Demyan a tall, blue eyed and mysterious man who knows a lot more about her than he should. This book! I really enjoyed the world and the story and the characters, literally everything I enjoyed. I can't believe this is only a novella as I need to know more about Totems and Immortals, I need to know more about the relationship between Nika, Alex and Demyan, I need to know what happens next!! I really can't say too much as I don't want to spoil anyone who wants to jump into this world, I just hope there is a novel length book in the works as I really want to read it now. My only complaint about the novella is that there are quite a few spelling mistakes and incorrect words used, so it could have done with a little more editing. But I'll forgive it them as I did thoroughly enjoy it and the writing itself is very good. I started this book on the 23rd of June 2016 and I finished it on the 24th of June 2016. 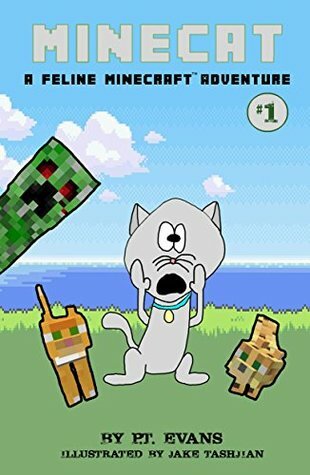 I received an e-book copy of Minecat: A Feline Minecraft Adventure by P.T. Evans direct from the publisher in exchange for an honest review. Something a little different on my blog today, a children's book, so as it is a little different my review will be a little different too. The first half of the blog will be my review of the book and the second half will be the review from my 7 year old Nerdling. Minecat was a quick easy read and was enjoyable enough. The story follows Spike the indoor cat who has his own "outdoor" adventure in the world of Minecraft. The language used is simple enough but with some longer words that caused Nerdling to ask about them, which is always a good way to teach new words. The illustrations were not to my taste, they felt very amateur against the back drop of the Minecreft screen shots. Not a bad children's book, but not one that I would enjoy reading to them more than once. I really enjoyed the story and I think Spike is very funny. I liked the funny drawings, they made me laugh. I didn't think Jason was very nice as he ruined everything that Spike had done in Minecraft. I would like to read more stories about Spike. Overall definitely a children's book that makes the child happy, but not necessarily the parent who might have to read it to them. I would still get the next in the series for my Nerdling as she enjoyed it and she can read them herself. We read this book on the 19th of June 2016. I gave this book 3 stars on Goodreads. Nerdling gave this book 4 stars out of 5. 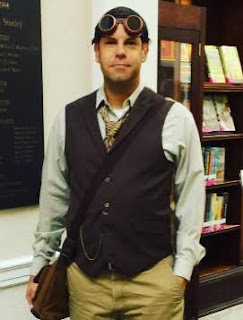 Today I am very excited to be bringing you a q&a interview with the author of Sigmund Shaw: A Steampunk Adventure and Whispers of Bedlam Asylum, Mark C. King. I have been lucky enough to have read both of his books and they are awesome,! (If you want to check out my reviews they are here and here). The short answer is 'no'. When I was around ten years old, I tried to write a book but gave up within an hour or so - this simple experience helped me appreciate, even then, that the arrangement of words into a story is not easy. It was probably twenty years before I tried writing again, with most of that time not thinking about being an author. An interesting coincidence happened that got me to complete my first book. I had a long drive to work, forty-five minutes or so, and I would listen to music on the way in. There was one particular album that I liked a lot and listened to regularly (Muse - Absolution). For some reason, I had the thought "what if this album was a soundtrack to a movie?" That started me putting scenes to the music while I drove to work just for fun. I came up with a bit of a story but did not think I would do anything with it. Not long after this, a fellow employee published a novel. I was impressed and picked his brain on the process. It was at that point I knew I would write the story I had been creating on my drive in. The book is not a Sigmund Shaw novel. It is a fantasy novel that, in my opinion, is very rough and shows my inexperience at writing. The company I used to publish it is one that I think would publish most anything. I believe the book is still available, although I think it sold less than ten copies. 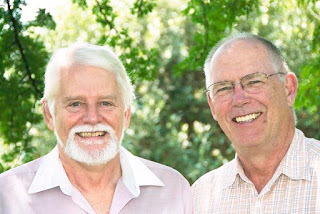 This was probably five years before I wrote Sigmund Shaw - which I consider my first real book, The advancements in self-publishing has made the process much easier. What is it that drew you specifically to steampunk and the Victorian era? Reading Jules Verne and Sir Arthur Conan Doyle is what mainly drew me to this genre and era. I love their stories and the way they make the time period come alive. I also love gadgets and the steampunk genre is big on gadgets. There is also something to be said about the vulnerability and innocence of the time period. It was just the beginning of the modern era, with machines and medicines, and that leaves a great many options for an author. Sigmund Shaw is a wonderful character, is he based on anyone in real life, or is there any of you in him? Sigmund Shaw is not strictly based on anyone, but I cannot deny some of my traits being included. The most prominent is his guilt for his past wrongdoings, I do not know if I would steal if I was in his situation, but if I did, the guilt would haunt me. I tend to hold onto my mistakes - maybe too much. 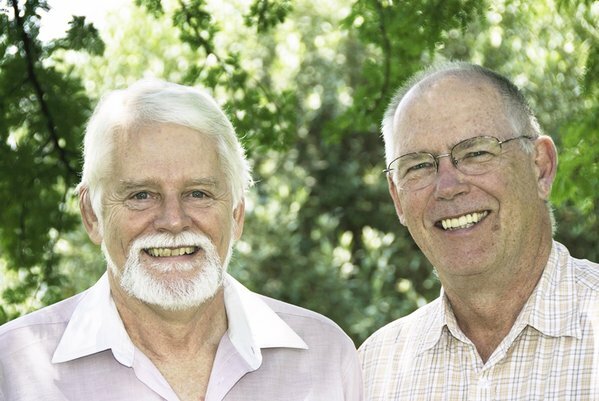 The character also is happy to spend time with friends and family. He does not need money or fame to be satisfied. I try very hard to have this same attitude. Although I have never been in a life or death situation, I would like to think I would sacrifice myself for others. In that respect, Sigmund represents the part of me that I hope exists. We've followed Sigmund on two adventures so far, what can we look forward to next? I have a book in progress that has Sigmund returning. However, I'm struggling to call it the third Sigmund Shaw book as the main character is his niece, Sarah. It did not take long for me to realise that Sarah is probably the most interesting character I have created and the feedback I have received is along the same lines. So, Sarah takes front and centre in a mystery in Egypt and I am very exited how it is turning out! I'm about three-quarters of the way through the first draft. When you're not writing what do you enjoy doing? When not writing, or working my day job, I enjoy relaxing with my wife and watching shows or movies. We have good friends and love to spend time with them. I enjoy reading and find that it inspires my writing dramatically. When time allows, I also enjoy playing sports, most anything, and the occassional video game. Your books are set in Victorian London, did you have to do a lot of research to make it feel as "real" as you did? Yes, I did a lot of research to try and get a feel for the time period and the area. I hate to admit this, but not only have I never lived in Victorian London, I have never even been to London. Why write a book that takes place in a city I've never been too? The answer is that I have a hard time picturing a steampunk novel happening outside of Europe. The "Old West" is a significant genre of steampunk, but it is one that does not really interest me. My novel had to take place in Europe, particularly England. Although I did research on terms used, habits and customs, I also looked at many steampunk artwork pieces that are on the web. Nothing puts me in the right mindset more than these incredible pictures. One other tool that I used a lot was Google Maps. Not only did I study maps of London to know where things were, but I also used the street-view feature and "toured" London that way. In no way does this compare to actually being there, but it gave an insight into the look and feel of London that was extremely helpful. With street-view I "walked" many of the paths that Sigmund took in the story. If Sigmund was transported to the modern day, what do you think he'd make of all the gadgets and technology as he's a bit of an inventor himself? My initial thought is that he, like anyone from then, would be quite intimidated at first. However, once beyond the shock, I think he would be quite amazed but a touch disappointed too. There is an elegance to the clockwork gadgets that he is accustomed to that modern gadgets lack. Perhaps a feeling of regret that his talent, and that of his fathers, was a thing of the past. Do you have a writing routine or a favourite place to sit write? I have a full-time job, so my writing time is somewhat limited. Although I am not a morning person, I do find that I seem to be more inclined to write before work. Depending on what is going on in my head, sometimes I will write at odd times just to get the ideas out, it is not uncommon for me to email myself ideas so that I do not forget them later. I have built myself a desk and I am hoping to turn it into my "writing area". Most of the time, I;m sitting on the couch with my laptop. Ok, time for one last bonus question, tea or coffee? I enjoy tea very much, but coffee is my first choice. An absolutely huge thank you to Mark for taking the time to answer my questions! It has been extremely interesting finding out some of the "behind the scenes" secrets. I received an e-book copy of Emotion Market direct from the author Dimitris Chasapis in exchange for an honest review. 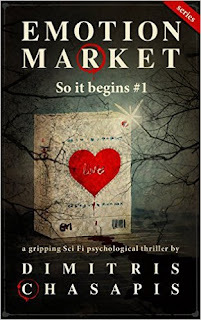 The story follows multiple characters, but in main you follow Dr Caroline Emerson who is the creator of the Emotion Market, an invasive procedure in which you can have your emotions turned up or down depending on your needs and wants. The story is extremely interesting and raises a lot of valid questions about the moral implications of using this kind of technology, It is a well thought out technology which probably isn't too far off what we might be able to achieve in the future. I've found it very hard to review this book as though I think the premise is excellent and intriguing, I think the execution didn't fit. There are a lot of changes of perspectives, which I normally don't mind at all, but at times I was confused as to which character I was supposed to be following. I also thought there was a lot of information dumping, which may be because this is a sci-fi and I don't read much of it, so it may just be the way things are done differently, but for me I started to zone out at certain points, especially during some of the long speeches. I would also like to mention that though, yes I agree this is sci-fi, I do not think it is a psychological thriller. Though there are secrets and lies, there isn't really anything too intense or anything too far from what you'd expect people to be doing when a new kind of technology comes out anyway. The big happening in the book doesn't actually happen until you're 95% through the book, so it comes and goes so quickly, there's not much of a pay off for the reader. Even though I personally had problems with the book, I still enjoyed it and again I'll say the idea is amazing and incredibly interesting, so I'd recommend people to give it a try and make their own decision. Today is my stop on the blog tour for Deadly Harvest by Michael Stanley, the fourth instalment following the wonderful Detective Kubu. Last year I was lucky enough to review A Death In The Family (my review is here) and at the time I said I was looking forward to getting time to read other books in the series, so when this blog tour came up I jumped at the opportunity to learn more about Detective Kubu and follow him in solving cases. I mentioned it last time, but I'll mention it again this time, but you would never know that there are two authors writing these books. The whole thing is so well written and it flows beautifully. There aren't sections that you can tell that are written by one person or the other which is what I've found when reading other books by more than one author. The story itself is wonderfully crafted and is full of the twists and turns that I now expect from a Michael Stanley book. I don't want to say too much about the contents of the story as I don't want to spoil anything for people, but it is a lot darker than A Death In The Family and I really liked that about it, I felt because of the darkness I was drawn deeper into the story and I felt really invested in what would happen next to the characters. The setting of Botswana is a wonderful backdrop to the story and again I learnt so much more about it and it's people and traditions. I very rarely read books that are set in places other than America, England or a fantasy setting, so it is really interesting to diversify into such a different country. There has been a lot of research gone into making sure a true image is given and it really shows. I have to mention how well rounded all the characters are, in patricular Detective Kubu. Kubu is just an amazing character, he's intelligent, he's funny, he's caring, he loves his family and he totally owns the fact that he is a larger frame. I really enjoy following him and seeing the way he goes about his day and how he works his way around a case. Overall an excellent book and I thoroughly enjoy it to anyone who loves their crime novels. 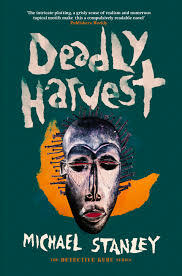 I received a copy of Deadly Harvest from the publisher in exchange for an honest review. My reading in May has been wonderfully mixed as usual and though it looks like I haven't read as much, I have in the fact that the books I have read this month have been a lot longer in content. I haven't however got around to reading my single issue comics yet, though I have got a journal ready to start keeping a record. I still haven't decided quite how to write them in, so I've been putting off starting. Hopefully in the next few days I'll have something figured out. 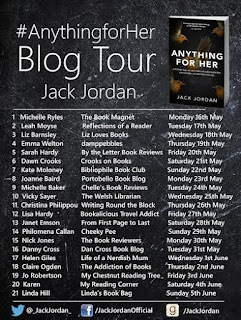 Over the next month I have three book tours, the first one being on the 1st of June (so it might actually be up before this post) for Anything For Her by Jack Jordan. I will also be reviewing a few comics once I start picking them back up, as when I first started blogging it was comics that I started with and it'll be nice to get back to that in a small way. In May I visited the Enid Blyton exhibition at the Scarborough Museum and I'm actually hoping to have a blog about the experience up in the next few days. Small spoiler, but I loved it. I'm looking forward to all the books for review I have lined up for June and all my new books that I want to fit in around them. Have you read any of these books? What did you think about them? 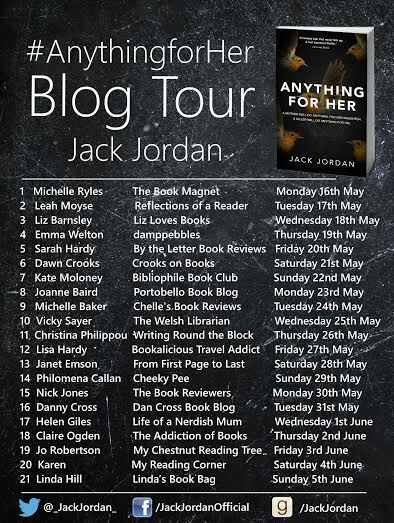 Today is my turn on the blog tour for Anything For Her by Jack Jordan and I'm bringing you my review of the book. This is one roller coaster of a book! I did not want to put it down and I needed to keep reading to find out what happened. The story follows Louise and her family and it starts off right when her family life is in the process of imploding. Her husband will probably be going to jail for fraud and the family will lose all their possessions in the process, her husband has also just confessed to having a 10 month long affair with her sister and Louise herself and their daughter Brooke are keeping a devastating secret from one night a year ago. Lost in all of this mess is the ten year old son, Dominic. Louise decides to leave for a few days to their country house to escape all the drama and to have some time to herself to process and recoup. This is definitely not what happens. Strange happenings start happening both to Louise at the country house and to Brooke at their home. Michael (Louise's estranged husband) wants to know what happened "that night" to make everything change so much and he wants his wife back. Things from there just get worse as Brooke goes missing and Louise becomes the target of a strange hate campaign while the police who are trying to find Brooke are also trying to find out Louise's secret. And boy do you want to find out as well! More than that I don't want to say anything about the plot as I really don't want to spoil anything. The book goes places that I haven't seen before and it is very, very dark. It also shocked me in more than just the darkness which was a great movement away from the typical psychological thriller with its predictability. As a mum I know I will do anything for my child, however Louise goes to a length which I'm just not sure if I could go to. I realised once I'd read that section that I'd been holding my breath I was so tense about what was happening. It was just so well written though I couldn't tear my eyes away from the page. Overall an absolutely intense and absorbing read which will stay will you for a long time. Go and do yourself a favour and read it. 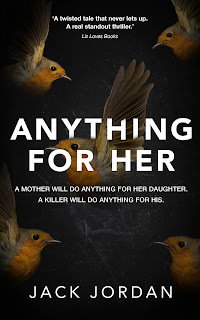 As part of the blog tour, I received an e-book copy of Anything For Her direct from the author Jack Jordan in exchange for an honest review.